in rhel (stage 2 is not included in initrd) also in case of using remote stage 2, and in rhel 5 also in case of using remote repositories. Once the device is activated, it can't be reactivated with changed configuration (e.g. static configuration with fixed nameserver, see bug 504983). I want to offer this possibility in GUI which requires option to activate/disconnect a device on demand (see device activation). It can be worked around by editing configuration files. Can be done with kickstart or in GUI using nm-c-e. Undesirably, checking Connect Automatically in nm-c-e will activate the device after the configuration is saved (see ONBOOT side-effect). I am not aware of any problems caused by this side effect which is invisible to the user (Anaconda doesn't wait for NetworkManager activating the device), but I can imagine there might be some lurking. As you can see, configuration of installer environment and target system is not separated. It is because using nm-c-e for enablement we have to use the same configuration files. At the end of installation the config files are copied to target system. On Live CD, network is configured in Live CD environment using NetworkManager Applet on panel. We don't copy ifcfg files in this case as up to F14 NM didn't store configuration in ifcfg files by default. The situation may have changed in F15 with NM 0.9 (TODO bug numbers). These anaconda boot options can be used to enable network in loader (e.g. for getting kickstart, updates image, or for vnc): asknetwork, dhcpclass, dhcptimeout, dns, essid, ethtool, gateway, ip, ipv6, ksdevice, linksleep, mtu, netmask, nicdelay, noipv4, noipv6, wepkey, wpakey. Kickstart network command can be used both to enable and configure devices. The behaviour has been changing in the course of adoption of NM. RHEL 5 - in case of network installation the first network command from kickstart activates or reactivates (if the device has already been enabled e.g. to get kickstart using default DHCP or configuration given in boot parameters) relevant device with configuration set by the command. For non-network installs (e.g. for media or hd install) the device of the first network command is only configured for target system. Other network commands only set configuration for target system, the devices are not activated in installer. RHEL 6.0, Fedora 15 - the same as in RHEL 5, but already activated device is not reactivated with configuration set in network command , it is only configured for the target system. Another difference from RHEL 5 is that the first network command device is activated also for non-network installs . RHEL 6.1, Fedora 16 - expected behaviour is the same as in RHEL 5 (bug 668395) with option to activate additional devices using new network --activate option (bug 638131). Note that the device from first network command is (re)activated regardless of the option (to keep the behaviour of RHEL 5). For RHEL 6.0, Fedora 14, and later, devices that are supposed not to be activated in installer and have onboot option set will be activated just before downloading packages due to ONBOOT side-effect. We have no reports of problems caused by this, but in some cases activation of the device could cause a change of routing table making packages inaccessible. Serves for selection and/or configuration of a network device that should be enabled in loader. It is skipped if the information is provided via boot options or kickstart unless required by boot option asknetwork. Configuration options of this UI are a subset of nm-c-e which is used in GUI. Once the device is successfully activated, there is no possibility to change its configuration in loader UI (see bug 504983). If both IPv4 and IPv6 configuration is enabled, failing IPv4 configuration of activated device means that activation is considered as failing overall (which corresponds to Require IPv4 addressing for this connection to complete checked in nm-c-e or IPV4_FAILURE_FATAL=yes in ifcfg file). Gateway: entry is used both for IPv4 and IPv6, only one gateway is allowed. Bad, consistent with boot options and kickstart. Name Server: entry can contain more name servers separated by comma. IPv4 Address: and IPv6 Address: is present only if manual configuration of respective protocol is selected in the previous dialog. nm-c-e is run as a separate process. Anaconda should ensure that the selected device will be actually activated in installer. The saved (target system) configuration will not be applied to a device that has been already activated in the installer environment. To achieve this, the device must be deactivated and reconnected which can be done only from shell in tty2, for example by editing of configuration files. See this issue for details. On the other hand, the device which had not been activated yet will be activated by checking Connect Automatically. Rather limited compared to nm-c-e. In F16 (where a NM bug was fixed) just editing the ifcfg file (instead of removing an copying/creating) should do the trick. We should consider adding nmcli to install image. At the end of the installation, ifcfg files are copied to target system tree to directory /mnt/sysimage/etc/sysconfig/network-scripts. Automatic use of device configured in iBFT and having active link. Kickstart network --device option. For the first network command defaults to ksdevice boot option, device used to fetch kickstart, or prompt in loder UI (how about detected iBFT device with link?). If there are essid and wepkey or wpakey specified, wireless device will be used. For next network commands --device option is mandatory (will be enabled only with --activate option set). Dialog in loader UI if none of above applies. 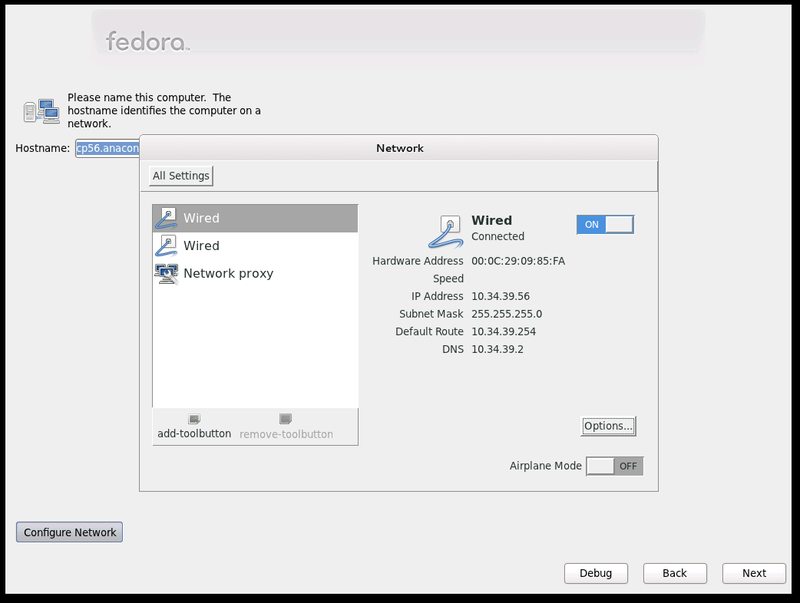 Passing SSID and WEP key with boot parameters or kickstart is supported in Fedora 14. Other methods of authentication can be set in GUI using nm-c-e, although there are some issues with AP selection which could be solved with integration of NetworkManager Applet or its substitute. Vrata Podzimek is working on WPA support for kickstart and boot options (wireless activation in loader). Patches are on a-d-l and should go to F16. Status updates can be found in comments of bug 473803 or on feature page Support wireless networking during installation. gateway option is common for ipv4 and ipv6 in boot options, kickstart, and loader UI. The problem is that it allows (unlike nameserver/dns) only one value (bug 562538). I think adding --gateway6 and gateway6 to ks/boot options is a way to go, rather than allowing both values in existing gateway option. IPv6 accessibility of Fedora repository mirrors. From what I know it should be working. I don't have access to an outer ipv6 world so I can't even try it myself. We'd like to let NM do the most of the job where possible. We have to bear in mind minimal installs without NM. NetworkManager can update it with HOSTNAME with SaveHostname method. Basic files are written by anaconda in loader, updated in loader if activating device, updated in stage2 if configuring device in ks, updated with nm-c-e in GUI. For wireless the * should be replaced with SSID, not device name. Created by NM when configuring wireless, copied to target system. NM merges it into its dhclient file. Anaconda writes only vendor-class-identifier option based on network --dhcpclass kickstart setting. Used to write also host-name for network --bootproto=dhcp --hostname=<HOSTNAME>, but it is handled by NM and DHCP_HOSTNAME written by anaconda into ifcfg file. Should we copy the file on target system? Probably yes - bug 476364. Yes, we set dhcp timeout for NM in the file (from dhcptimeout boot option). Anaconda doesn't touch it. AFAIK, NetworkManager updates it based on host-name dhcp option (for assigned IP and 127.0.0.1). Anaconda doesn't touch it, it is generated by NetworkManager. Anaconda copies the file generated by udev to target system. It is possible that we shouldn't do it as we don't change it and the file is generated on boot by udev anyway (bug 652499). DVD install defaults to ONBOOT=no leaving networking down after reboot - bug 498207. This is rather sore issue. Only devices enabled during install will have set ONBOOT=yes by default. For other devices, the setting has to be configured. Default was changed in F16 - for non-ks installs if the network was not enabled during install set ONBOOT=yes for first (non-wireless) device with link detected. Currently, it can be worked around only by editing configuration files. Wrong static configuration (e.g. wrong nameserver). The device is considered as active (networking enabled) and a user doesn't get a chance to fix configuration in the point of fail (adding network storage, network repositories). Adding configuration of another device, e.g. for iSCSI target on separate subnet. This won't deal with iBFT though, see bug 710366. Related bugs: bug 592856, 504983, 635239, 688527 (rhel6-branch), 697066, 705023. Places in the GUI where access to network (re-)configuration (regardless of whether the network is enabled or not) would be useful. Standard step (the hostname screen) with optional network configuration. It is the only opportunity currently. Repository UI screen. Note that this wouldn't help in case of edit of failing base repository which happens in the dialog before repository UI screen step (tasksel step) so successful enablement of network with wrong static values (e.g. dns) is fatal here. I attempted to reorganize repository UI to deal with it ..
Before reboot to give chance to automatically activate a device after reboot, see this issue. our own UI - it has some functional limits an was kind of first draft with UI to be polised. This is not a way to go, I don't want to duplicate and maintain the code. Integration of NetworkManager Applet was refused due to UX concerns at FudCON in Tempe by the team, as it requires integration of panel into installer UI which was regarded as confusing. I must say that I don't share the UX remarks, on the contrary, I see it as logic and expectable place for permanent access to network configuration (which is right thing IMO)..
1) Add single-panel mode option to g-c-c where [All Settings] button is removed, making only network configuration accessible. 2) Add device description to g-c-c panel, see there is only 'Wired' and MAC address currently. 3) Add window decoration button ([X]) to be able to close the window/app. 4) nm-applet is needed to provide user secrets agent service, though the applet itself will not be exposed anywhere in anaconda UI - it will only provide dialogs for authentication etc.. We need to open a session in ConsoleKit for anaconda (and pull ConsoleKit into the image). In master, running ConsoleKit service kills NetworkManager, seems to hit https://bugzilla.redhat.com/show_bug.cgi?id=703734. 6) Size of the image - something to be explored yet. In my initial tests I added control-center package, nm-applet (negligible), commented out removal of some files from ConsoleKit package (required by nm-applet). This made change of about 8-9 MB, but there are definitely opportunities to make it better (painfully). Seems that I'll have to wait for new UX design. to have working default ifcfg file for network service BOOTPROTO is required - unlike for NM. Bugs 636526, 705718, 741199. This should be fixed in F16. network service is off by default - it's business of initscripts or systemd. Bug 702261, 745518. [Back] in loader UI, Manual TCP/IP Configuration screen, doesn't work in F15. It does on rhel6-branch so I guess it got screwed up in master by some other patch since I had fixed it (commit ec146852176e2b41ace7725ed8eda337842d3160). Now works only in STEP_NETWORK, might want to add it also for early networking and getting ks/updates. Given we are aiming to get rid of loader and the state of loader UI steps code (complicated, fragile, incomprehensible setting of flags) I am leaving it as it is. Multiple NICs: Routing and interface binding (bug 500273, bug 737794) issues. For storage target and ks/repositories on separate subnets: 638131, bug 710366. Interface binding. First stage: all nodes bound or default. Next stage: extend libiscsi, per-node choice - default as one of interfaces to choose from (do we even want this?). can be done using network --activate command or in GUI with nm-c-e (which lacks support for iBFT configuration though). You have to check Connect Automatically to activate the device. Consistent Network Device Naming - aka biosdevname - get rid of HWADDR and DEVICE? NM is not ready for it (690589). VNC install: -nevershared passed to Xvnc results in an inability to control install 628477 - I don't know why it is there. noipv4 and noipv6 probably don't work correctly for more devices activated with different settings in some cases because loader is using global flags for it. We should use IPV4_UNUSED_METHOD in loaderData->ipv4method or reset the flags when processing ks at least (master, rhel6-branch). ifcfg-rh updates /etc/sysconfig/network but it seems that it just writes out a new one with HOSTNAME= only. DHCP_HOSTNAME (makes client send host-name option to dhcp server) is set in ifcfg file for "network --bootproto=dhcp --hostname=<HOSTNAME>". Relevant NM bugs: bug 596242, bug 488975. StandaloneSpoke before hub #1, when present? Shortcuts from relevant spokes like sw source, network storage? Not sure if doable neatly in the framework. As global environment setting: In installer, this could serve as global setting for all repos. Another request: environment variable for %post (e.g. when using wget there)? For system configuration, it doesn't seem to make sense doing it in the installer (neither via GSetting org.gnome.system.proxy nor via http_proxy env variable). See also bug 788537. Writing ifcfg files directly - this is what we do now. For ibft (BOOTPROTO=ibft) this is the only option as the config is read from ibft by ifcfg-rh plugin. Using dbus interface - we do wireless configuration this way, we let NM write ifcfg files and keys configuration files. Using glib interface - NM has gobject introspection support and NM glib API seems more convenient and has quite a lot of useful utility functions. To be designed - where to place it ? Storage is using hostname value for default names of LVM volume groups. RAID members used to be named using actual hostname by mdadm, but it seems not to happen currently. So we need hostname configured before storage is configured (or can drop default naming using hostname). For F18 it is in network spoke. some packages may require hostname to be set during installation? https://bugzilla.redhat.com/show_bug.cgi?id=856456. Realmd. use the service (dbus) to set it? how does it get along with NM? Get kickstart support back (loader used to handle essid, wepkey, wpakey ks options). This is currently in dracut. Requires NM in dracut. UI of gnome-control-center has changed, but there will be even more radical changes coming. They seem to want to drop nm-c-e.
BOOTPROTO=ibft is done by ifcfg-rh, not in NM api! This may limit us in anaconda. Perhaps think about shortcut to network configuration (I'd rather not push UI flow this way). Copy routing configuration (from nm-c-e) to system. This might become required by some multi NICs setups (e.g. for iSCSI/multipath). Support for some rhel 6 features (they were backported to rhel 6 from rhel 5)? This page was last edited on 8 August 2018, at 00:40.